﻿ Domaine des Alizees Club & Spa by Evaco Holiday Resorts Pulau Mauritius. JIMAT di Agoda.com! Ada soalan mengenai Domaine des Alizees Club & Spa by Evaco Holiday Resorts? Dibina pada 2012, Domaine des Alizees Club & Spa by Evaco Holiday Re merupakan tambahan menarik di Pulau Mauritius dan satu pilihan bijak bagi para pelawat. Pusat bandar hanya 2.0 Km jauhnya dan boleh sampai ke lapangan terbang dalam tempoh 75 minit. Penginapan ini berada di sekitar kawasan tarikan bandar yang popular seperti Ebrahim Travel & Tours, Kedai Jalan Diraja, Northview Tours. Domaine des Alizees Club & Spa by Evaco Holiday Re menawarkan perkhidmatan yang sempurna dan semua kemudahan penting untuk menceriakan pelancong. Fasiliti utama di penginapan juga termasuk Wi-Fi percuma semua bilik, pengawal keselamatan 24 jam, pengemasan harian, penghantaran barang runcit, khidmat teksi. Suasana Domaine des Alizees Club & Spa by Evaco Holiday Re terpancar di dalam setiap bilik tetamu. televisyen skrin rata, ruang tamu asing, kolam renang peribadi, internet wayarles (percuma), bilik larangan merokok hanyalah sebahagian daripada kemudahan yang boleh didapati di hotel tersebut. Di samping itu, pihak hotel menawarkan aktiviti rekreasi untuk memastikan anda mempunyai perkara untuk dilakukan sepanjang penginapan anda. 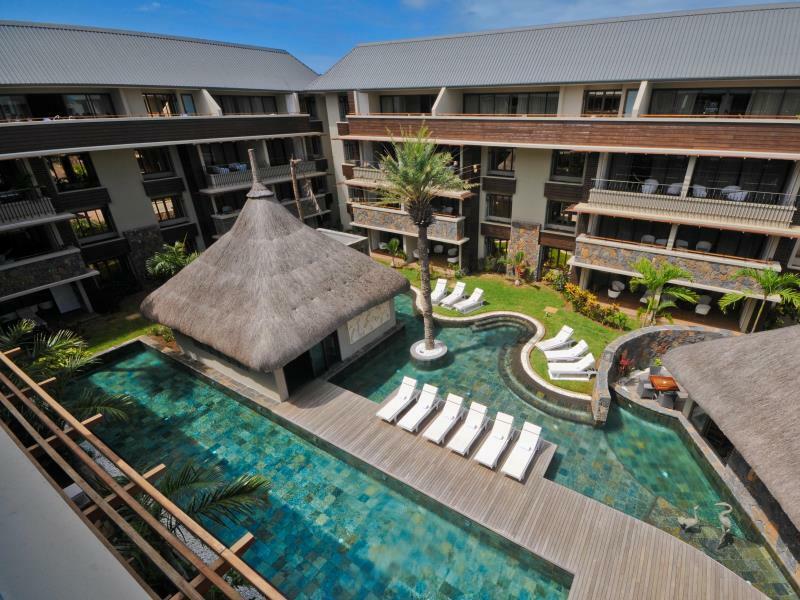 Domaine des Alizees Club & Spa by Evaco Holiday Re merupakan pilihan yang bijak bagi pelancong ke Pulau Mauritius, menawarkan penginapan yang santai dan mudah setiap kali. The hotel looks pretty but lacks atmosphere. The apartment is well laid out and spacious but one major issue are lights. The lights are so impractical - the apartment is very dark and almost depressing inside. The breakfast is not served in the restaurant but you have to wait for a maid to bring it to your apartment (we had isseus with times and you only get couple of mini pastries, butter, jam, juice, coffee - every day the same boring selection...not a 5*). Good place to stay over nights but do not expect anything else. Domaine Des Alizees provides good accommodation for families. It is clean and spacious. The breakfast could be better with more offering. It should also be brought earlier as activities start in the morning. It would be great if there was an aircon in the lounge/kitchen area as it gets very hot and the fan is not effective but the air con in the rooms are good. There are a few bugs in the villa so spraying should be considered. Location is good as it is close to nearby malls and shops The private beach La Plage is an excellent beach but the service could be better and faster. Nice resort ! Good value for money. Private beach area nice but little drive away! Had a great stay!!! 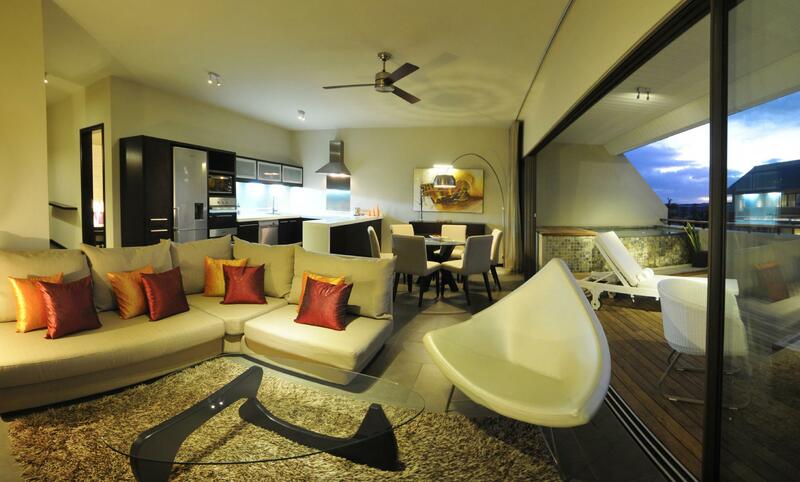 Beautiful apartments, excellent equipment, very clean with stunning pool views. However, we were surprised to find out complimentary water is not provided in your room throughout your stay, even though the water is not even drinkable from the taps. My friend whom I stayed with at this hotel is a cabin crew member for a well known airline, therefore lives out of hotels; had gently suggested to reception complimentary water should be provided like all other hotels around the world in hot climates. However the reception staff did not listen to this basic constructive feedback. Water is expensive at the hotel, always a shortage of towels and the food needs improving at the all inclusive buffet, staff service needs to be more alert and attentive. Shuttle bus to the private beach takes around half an hour as it stops at other hotels along the way, therefore it is worth hiring a car so you can create your own itinerary. Don't ever book this hotel, it is like you are being scammed: 1. The pictures of the beach on the page are actually the resorts private beach which is not so bad apart from the fact that it is a 15 minute drive away and you have to pay MUR300.00 for a beach bed. 2. They offer 'Half Board' the cheapest because it is a scrappy continental breakfast with just a croissant, tea and juice and a small plated dinner with NO drinks so you must pay MUR110.00 per small scrappy drink! 3. Staff are arrogant and unhelpful, they don't even have a 24 hour desk, we checked in late at 10pm they did not want to arrange dinner for us and they never bother to arrange early breakfast for us on checkout! 4. The cleaning staff never changed the sheets even though from check inn there was blood on my pillow case, they forgot to empty the small bins from time to time, the 1st day we had to actually phone them to come clean the room. 5. There was no hot water from time to time! 6. It is a scrappy hotel in the middle of the bush with no signage and nowhere near the sea! 7. I was given this hotel by Agoda as compensation for messing up my booking but I will never ever book here again! Location is far unless you have a car. hotel theme is very good and room rates are very reasonable . Domaine des Alizees Club & Spa by Evaco Holiday Resorts is located at a somewhat wild place (new construction project) and a little bit far from the beach and shopping center. It’s convenient if you drive a car. The room is big and spacious for 6 persons to stay (we stayed at 3-bedroom house). It is very good for family travel (kitchen utensils are enough) to visit Mauritius. We had a fantastic holiday in Mauritius which was helped by our stay at the Domaine des Alizees. Very friendly staff, wasn't hugely busy in the restaurant, has a great bar. Our suite was very spacious and very well appointed. the hotel is in a sense self-contained, there aren't any great outdoor views but views into the interior of the hotel itself which was ok. the rooms are well furnished and comfortable. the location was a little further from town than we had expected, but still wasn't too bad. staff were also friendly and helpful, obliging us when we requested a room change. all in all a nicely appointed hotel. 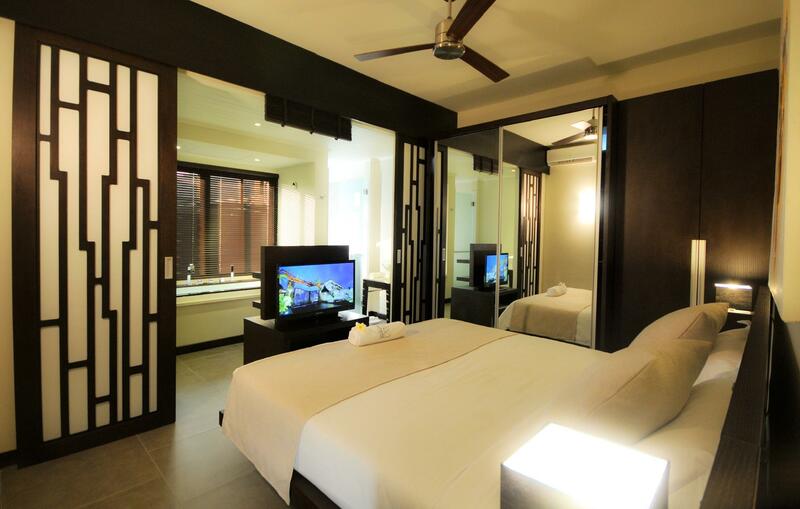 The hotel is clean and the photos on the internet are a reality, great design and comfort. For some unknown reason, during our week stay, the restaurant and the spa were closed. On the last day I accidentaly cut myself with a knive and went to Grand Baie Clinique- which has no conditions at all ! their staff has very poor knowledge of basic assepsy and first aid ?! Be attentive as accidents can happen at any time and we all want to be sure that a minimum of services are available. Design, Large rooms, attentive and friendly staff. Stay was great, staff was very helpful and polite. Hotel itself is new, clean, very well designed. Quiet. Perfect for honeymoons, and had a beautiful private beach equipped with massages, restaurant, and water sports facilities. Only downside with the hotel during our stay was our internet was not working the whole time. Other than that, a highly recommended honeymoon hotel.